DESIGNED FOR APPLE IPHONE Xs. Compatible Model(s): iPhone X / Xs by Apple. PLEASE NOTE: Privacy filter may reduce display clarity. ADVANCED TECHNOLOGY BALLISTIC GLASS . Made from the highest grade Japanese Asahi glass, our multilayered privacy screen protectors are made with polished, rounded edges and provide 3D Touch Accuracy. TWO-WAY PRIVACY FILTER . Your screen is only visible when viewed straight on and fades as the phone is turned left or right to protect from prying eyes. REMINDER: Please turn up the brightness on the display, as our privacy screen will darken the image. IMPORTANT NOTE . The iPhone X / Xs screens have curved edges and this screen protector only covers the flat surface reducing the risk of bubbles. We've designed our screen protector so that it's easy to install, durable and offers maximum coverage. WHY SHOULD YOU BUY TECHARMOR PRIVACY BALLISTIC GLASS SCREEN PROTECTORS . MAXIMIZE YOUR RESALE VALUE . DID YOU KNOW a broken iPhone X / Xs screen is expensive to replace. For a fraction of the price our Privacy Glass Screen Protector will absorb almost any impact, sacrificing itself for your iPhone X / Xs screen. Tech Armor Privacy Glass is a low cost insurance policy for your screen. The Ballistic Glass screen protector pays for itself as the first line of defense from scratches and drops. We depend on our tablets and smartphones today, we fill them with sensitive personal data that must be defended from prying eyes. That's why Tech Armor developed Privacy Glass, to keep your information for your eyes only. No detail has been overlooked with this Best In Class product from Tech Armor, industry leader in screen protection. If you only accept the BEST then look no further: BEST 2 Way Privacy. BEST Protection from Drops/Scratches. BEST Touch Accuracy. BEST No Bubble Installation. COMPATIBILITY: Apple iPhone X / Xs, All Carriers, All Models (Note: Turn device display brightness up, Privacy Screens will darken the image.) 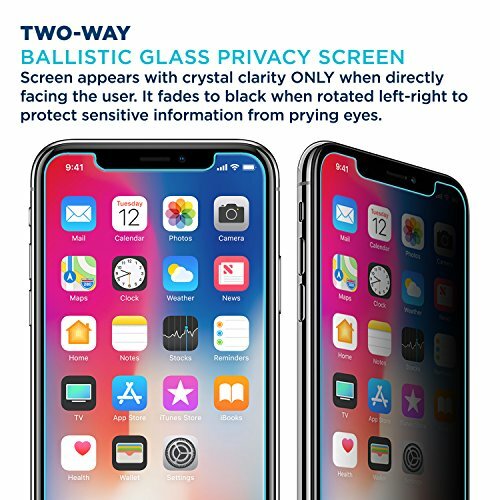 The Privacy Ballistic Glass Screen Protector Kit Includes: One (1) Privacy Glass Screen Protector (.3mm 9H Rating), Installation Instructions, Alcohol Cleaning Wipe, Microfiber Cloth, Dust Removal Tape, Retail Packaging, and The Tech Armor Limited Lifetime Replacements.